When the U.S. Army was reorganized on July 28, 1866 for peacetime service after the American Civil War, six regiments were set aside for black enlisted men. These included four infantry regiments, numbered 38th through 41st. The 25th Infantry was created during a reduction in March 1869 by merging the 39th and 40th. The consolidation took place at New Orleans, Louisiana and the regiment was sent to Texas. Colonel Joseph A. Mower was its first commander. Colonel John Andrews, the longest serving commander, presided over the unit from January 1871 until his retirement on July 4, 1892. The regiment stayed in Texas until 1880. Then it moved to the northern plains, and served in the Dakotas, Minnesota, and Montana until the late 1890s. At the beginning of the 1890s it became involved in the Pine Ridge campaign. Later in the decade it served in labor disputes that pitted owners against the Western Federation of Miners, notably the Coeur d’Alene, Idaho Mining War of 1892. The regiment also protected railroad property during the strike of 1894. Its units were dispersed at several posts, until 1897, when all the companies of the regiment were assigned together for the first time, at Fort Douglas, outside Salt Lake City, Utah. In 1896-1897, Company B of the regiment took part in a War Department test of the bicycle as a means of mobility for troops. Lieutenant James A. Moss commanded the “Bicycle Corps,” whose test culminated with a summer-long ride from Fort Missoula, Montana, to St. Louis, Missouri, a distance of 1,900 miles. Like the other black regiments, the 25th went to Cuba in 1898. 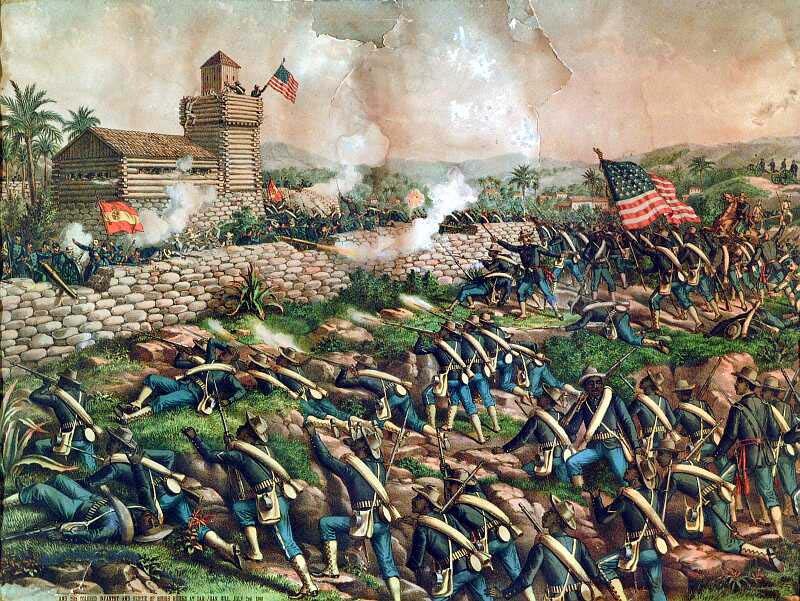 The regiment fought at El Caney, just north of San Juan Hill, on July 1, losing ten enlisted men and two officers. One of its men, Corporal Thomas Butler, was credited by eyewitnesses with capturing the Spanish flag at the blockhouse. Soon afterward the unit sailed to the Philippines and served there from 1899 to 1902, and again from 1907 to 1909. While at Fort Brown, Texas, in the summer of 1906, men of the first battalion were accused of firing on Brownsville civilians and killing a bartender. President Theodore Roosevelt attributed the failure to prove soldier culpability for the attack to a conspiracy of silence and dismissed without honor all 167 men in the battalion. Fourteen were later allowed to reenlist. First Sergeant Mingo Sanders, a combat veteran of Cuba and the Philippines with twenty-five years of service, was the senior man among those discharged and became the symbol of the injustice committed by the President. During World War I, the regiment became part of the 93rd Infantry Division, and elements fought with French troops in the Champagne, Verdun, Aise, and Anould sectors of the Front. The regiment was demobilized in March 1919, and only reactivated, at Fort Huachuca, Arizona, in March 1942. It was sent to the Pacific theater, where most of its troops had logistical and administrative assignments. Some portions of the regiment saw combat at Bouganville Island, before returning to the United States in January 1945. The regiment was inactivated at Fort Benning, Georgia, in 1947. John H. Nankivell, The History of the Twenty-fifth Regiment United States Infantry 1869-1926 (Fort Collins, CO: Old Army Press, 1972); Frank N. Schubert, On the Trail of the Buffalo Soldier: Biographies of African Americans in the U.S. Army, 1866-1917 (Wilmington, DE: Scholarly Resources, 1995).